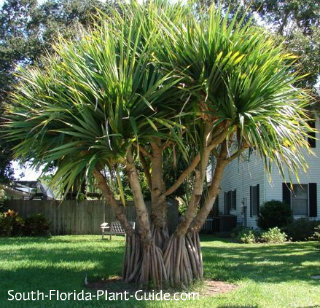 The amazingly bizarre screw pine creates a stop-traffic effect in a home landscape, with its swirl of foliage, showy leaf scars, and unique stilt-like prop roots. 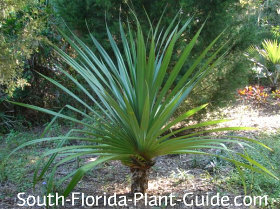 A novelty plant, this is not a pine or a palm - though it has a somewhat palm-like appearance. It's best used as a single specimen and given plenty of room because as it matures, a screw pine can take up 10 to 15 feet (or more) of space. These unusual trees can hurt you. There are wicked little red spines lining the edges of the leaves. Run your hand one direction on a leaf and nothing happens. But go the other way and - ouch! This accent tree grows in a giant swirly pattern, with old leaf scars encircling the stems - hence the "screw" in its common name. The "pine" derives from the pineapple-like unique fruits borne on female plants that are sun-grown. They're edible and very pretty. A mature tree has a bushy top with leaf scars forming a circular pattern, and aerial roots lift that the whole thing out of the ground. The roots keep the tree propped up and stable during strong winds and tropical rains. This plant works well in a tropical garden design style or it can add a dramatic touch to more subtle landscaping. Avoid placing near walks, drives, or children's (or adults') play areas. There's a beautiful variegated pandanus that stays smaller (4 to 5 feet) but it will spread so allow some space for it. Screw pines grow at a slow to moderate pace and can get 20 to 30 feet tall. They can take many kinds of light - from full sun to partial shade. 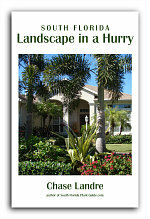 These trees are tropical and need the warm temps of Zone 10. In Zone 9B however, you can plant one in a container for the patio to bring inside during colder weather. Cold snaps can turn the leaves a bright reddish orange color. This plant is drought-tolerant as well as salt-tolerant, making it a striking accent for a coastal property - if you have the room. No soil amendments are necessary, though you can add composted cow manure to the hole when you plant. The only trimming needed is to remove dead or dying leaves by cutting them close to the stem. Water on a regular basis with time for the soil to dry out between waterings. Though these are drought-tolerant trees, they'll look their best with a regular and well-timed irrigation schedule. Fertilize 3 times a year with a good granular fertilizer. 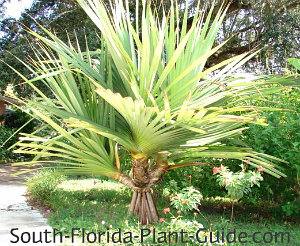 Plant at least 8 feet from everything...other large plants, the house, and more if possible from areas where passersby might be sliced and diced by the spines. Small shrubs can be planted 3 or 4 feet away from the tree's base. 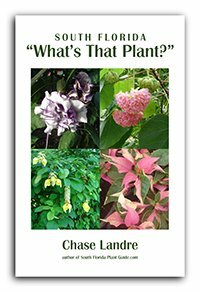 This tree will grow in a container, and the smaller variegated variety does very well in a pot on the patio or in the poolcage. 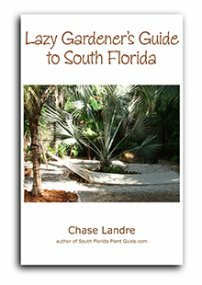 COMPANION PLANT SUGGESTIONS: Nearby plants might include Green Island ficus, dwarf ixora, cardboard palm, white bird of paradise, copper plant, hibiscus, and beach sunflower.